We measured the acoustic startle response (ASR) and blink reflex (ABR) in patients with clinically diagnosed Parkinson's disease (PD) and progressive supranuclear palsy (PSP) and determined the specificity of an abnormal result for the diagnosis of PSP. Thirty patients (11 PD, 19 PSP) and 12 age matched controls were studied. The PSP group was separated into clinical subgroups. 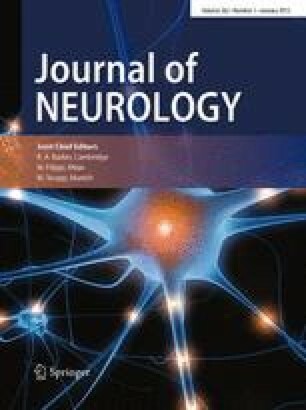 Fourteen patients with early falls, cognitive dysfunction and eye movement abnormalities were classified as Richardson's disease (RD), 3 with parkinsonism in the absence of early falls, cognitive dysfunction or eye movement abnormalities were classified PSP-parkinsonism (PSP-P) and 2 who presented with gait unsteadiness and freezing without cognitive dysfunction or eye movement abnormalities were classified as pure akinesia with gait freezing (PAGF). Following an acoustic startle stimulus EMG activity was recorded in the orbicularis oculi and sternomastoid muscles. The likelihood ratio of an absent response being clinically diagnosed PSP was determined. The ABR was present in 11/19 (58%) of patients with PSP, and 11/11 with PD and 12/12 controls (H2 p < 0.05). The ASR measured at the sternomastoid was present in only 2/19 (11%) of patients with PSP, but in 5/11 (45%) with PD and 6/12 (50 %) controls (H2 p < 0.05). The ABR was present in only 6/14 (43%) of the RD group, but in 3/3 PSP-P and 2/2 PAGF. Loss of the ABR was 100% specific for PSP, but only 42 % sensitive. Loss of the sternomastoid ASR had a likelihood ratio of 1.9 for the clinical diagnosis of PSP. The ASR and ABR appear unlikely to be useful in differentiating PSP from PD.Abnormalities in these responses are worse in RD where the pathology is known to be more widespread than in PSP-P and PAGF.